Yield: 2 pizzas, about 12-14" diameter, or 8 individual-sized pizzas, about 6-7" diameter. Put all ingredients except water in food processor with steel blade in place. Process for a few seconds, then pour the water slowly into the chute, a quarter cup at a time. Process until the dough comes together into a ball and starts to ride around on the blade. The dough should be somewhat dry, but not too stiff. Sometimes, due to humidity or whatever, you have to adjust by adding a little more flour or water. This becomes easy with practice. Turn out on board and divide into two balls. If not freezing, roll each ball in some olive oil and place in a bowl, covered with plastic wrap, to rise until doubled, about 1 to 1-1/2 hrs. Put the stone in the oven if it's not there already and start the oven at 450º. Then roll or stretch by hand the risen dough into pizza shells. Spread a couple of tablespoons of cornmeal over the peel and place one of the shells on it. [If you are making two, spread some cornmeal on a clean section of counter or cutting board and lay out the second one there.] Cover with a clean towel and allow to rise 1/2 hour. Note: the first rising may be slowed by placing the dough in the refrigerator. Or, it may be accelerated by placing it in a warmer environment. Pizza Stone A ceramic platter that the pizza sits on in the oven. Get the largest one that fits in your oven. Having two stones greatly simplifies the process of making two pizzas for a crowd. The stone can stay in the oven all the time, with your baking dishes just sitting on top of it. The stone must be preheated for at least half an hour before the pizza goes in. Peel A big wooden paddle, for sliding the pizza in and out of the oven. The size should be slightly smaller than your stone. If you wash it with water it will warp, making it less useful. I just wipe mine with a kitchen towel. If you do want to wash it now and then with water, be sure to wet both sides evenly and then dry it as well as you can with a towel. Food Processor Of course there was pizza thousands of years before food processors. But my dough recipe, developed for the food processor, is so easy you'll want to go out and buy that processor. Get one with a fairly large bowl -- I think mine is called an 11-cup bowl. Pizza Knife This wheel-bladed knife is also not essential but it's fun to use. Get a good one that will hold an edge as they are difficult to hone. All my pizzas are designed in three layers: the Base, the Toppings, and the Garnishes. When the dough is ready, spread the Base ingredients on and bake for 10 minutes in the preheated 450º oven. Remove from oven, add the toppings, and return pizza to oven. Immediately reduce heat to 400º and bake 10 more min. Pizza should be brown and crisp at the edges. Remember that all ovens perform differently, and be experimental about your timing the first few times. I developed this recipe using a convection oven, which is faster than a conventional oven. After you've done it a few times you'll know exactly how long each step takes in your oven. Brush the edges of the crust with a scant amount of olive oil, add the garnishes and cut into serving pieces. 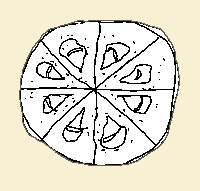 A note about design: Pizzas should look good, when they are whole and when they are in a slice on the plate. For that reason I always cut my pizzas into 8 slices, and when I put the toppings and garnishes on, I organize them according to the slices - especially when there are large pieces, like tomato slices, shrimp or medallions of fresh mozzarella. Often I chop up more of the large items and scatter them in the center of the pie. This leads to a design that looks like an 8-pointed asterisk. By doing this, I insure that all the slices are more or less the same and look organized and whole. You definitely need the larger cuisinart. When I tried it in mine the bowl was too small (for your recipe). so I used the Kitchenaide with the dough hook and that worked very well. My favorite pizza topping, especially when my crust is going to have a nice toothy rim, is raw eggs cooked to a sunny-side-up status by the oven. Where's the kneading? You only ran the dough in the processor until the dough came together. That's not enough time to stretch the dough and create all those strands of gluten to allow the pie to be stretched thin. FWIW, I've been baking bread seriously for about 10 years, and I've been through EVERY dough making process known to man, plus a few known only to me. After I got tired of hand kneading (often w/o good results) I discovered VanOvers food processor process (which differs from yours only in that his dough spends 45 seconds and yours less). My bread improved. And then I tried Lahey's slooow rise wet dough, and frankly, since then, all my breads are some variation of his process - I've never baked better breads!